Welcome Golfers! Please join us for the 10th Annual FCP Golf Classic, luncheon, auction and raffle for terrific prizes and once-in-a-lifetime experiences. 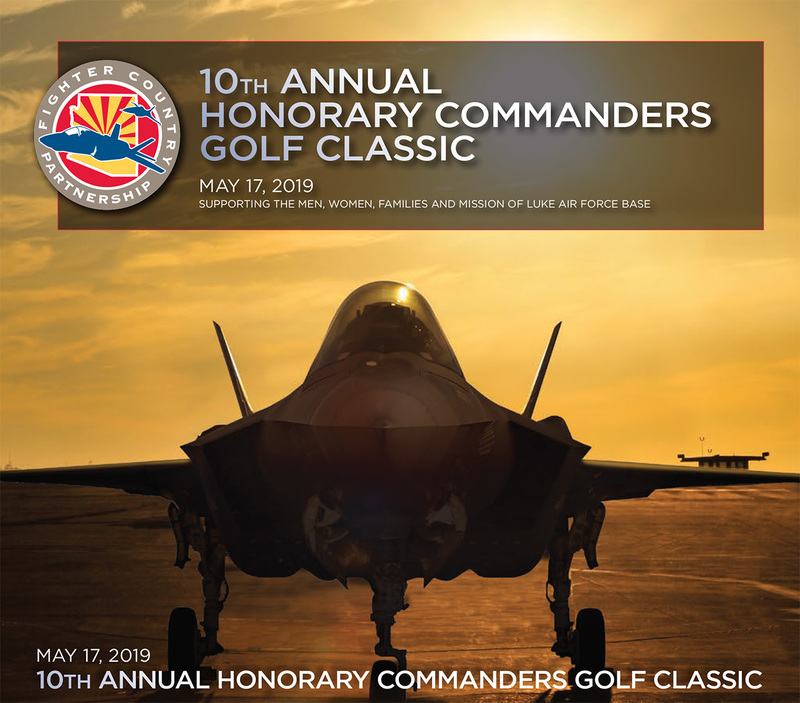 The Honorary Commanders Golf Classic raises money to support the Top 3 programs for Luke AFB, including Morale and Well-Being, Culture and Tradition, and Mission Sustainability. Tee box signage. Does not include foursome. Enter the name of the primary point of contact for the foursome or sponsorship. Enter the primary contact's mobile phone number. Please provide details about your foursome or sponsorship here and include as much information as possible. Also indicate if you would like to invite one or more Luke AFB Airmen to join your foursome or donate the entire foursome to Airmen. If you are registering a sponsorship that includes a pin flag name make sure to indicate what name shall be placed on the pin flag in the notes field above. If your sponsorship includes a tee box sign, make sure to upload a logo file now or email your minimum 300DPI CMYK logo to contact@fightercounry.org. In an effort to preserve the quality of your branding, we do require an EPS, AI, PDF or equivalent vector or print ready file. Secure credit card processing I have already sent or will send payment by check. Details where to send the check are available on the next screen. Fighter Country Partnership is an Internal Revenue Code Section 501(c)(4) social welfare organization. Donations are not deductible as charitable contributions, though they may qualify as business expense deductions, if applicable — please consult your tax adviser for more information. Fighter Country Foundation is a 501C(3) non-profit organization whose mission is to honor, serve and support the men, women and families of Luke Air Force Base. Copyright © 2008-2019 Fighter Country Partnership, Fighter Country Foundation & Imaginary Trout. All Rights Reserved.